Tension settings are an innovative means of mounting gems in a ring without visible prongs. The ring itself becomes the setting, holding the stone in place with pressure alone. They offer a unique, clean-lined look with the stone apparently suspended in air. Tension settings are a perfect choice for a minimalist, contemporary style. Tension settings require a great deal of pressure on the gem to hold it in place; only diamonds, rubies, and sapphires are strong enough to withstand such pressures. However, the mount is quite secure and affords a lower profile than traditional settings. With no tall prongs to snag on clothing or weaken over time, tension settings are an excellent option for lasting wear despite their seemingly fragile appearance. Metals used for tension settings must also be strong. Titanium, platinum, and white gold are common materials for tension mountings due to their strength, but yellow gold alloys are also a good choice. Regardless of the metal used, it must be specially heat-treated and worked to give it the spring needed to apply enough pressure on the stone to hold it in place. Because of the tremendous pressure exerted by tension settings, it’s important to choose a strong stone. Only quality diamonds can tolerate a true tension setting. The “four ‘C’s” of diamonds are especially worth noting when considering a tension mount. This “C” has nothing to do with the shape of a diamond and everything to do with the skill of the lapidary’s craftsmanship. A well-cut diamond has more fire and brilliance compared to one that is cut too shallow or too thick. As a tension setting will apply thousands of pounds of pressure per square inch on the stone, having a well-cut diamond is crucial; the stone must be strong. Diamond cuts are ranked ideal, premium, very good, good, fair, and poor in that order. For tension mounts, choose a diamond certified as an ideal, premium, very good, or good cut. Although most diamonds appear colorless, many have a slight yellowish tinge only visible upon close inspection. Jewelers rank diamonds from D (colorless) to Z (noticeably tinted). Stones in the G to I range of color have almost no discernible color; they’re a good choice for keeping costs low without diminishing the stone’s beauty. Consider the color of the setting closely when choosing a diamond, especially in a tension mount which puts such emphasis on the setting itself. A titanium, platinum, or white gold setting will make any tint in the diamond more noticeable, while a gold setting may hide a slightly warmer hue. In conventional settings, clarity is important largely for appearance’s sake. In a tension setting, though, clarity is also a measure of how flawed a stone may be; flawed stones are unsuitable for the pressure of a tension mount. Most diamonds contain inclusions, bits of matter or tiny air bubbles that are trapped in the diamond as it forms. Jewelers designate flawless diamonds with an F or IF rating. These stones are the rarest and are priced accordingly. Diamonds ranked as VVS have only tiny inclusions that are invisible to the naked eye and require a jeweler’s loupe to see. They’re also suitable for tension mounts. VS diamonds have very slight inclusions which may or may not affect their ability to go into a tension mount. Where and what kind of inclusion a diamond has affects its suitability for tension settings. Small black “freckles” toward the pointed base of a diamond won’t weaken it, but cloudy fracture lines within its heart may make a stone a poor candidate for tension mounting. Because a tension setting has no prongs to obscure a diamond’s brilliance, though, a VS stone with very slight inclusions will have maximum brilliance for minimal cost. Carats are the measure of a diamond’s weight. Simply put, more carats equals a larger stone. Tension settings emphasize the graceful shape of the ring as much as they do the brilliance of the central gem. A small diamond may be overwhelmed by a tension setting, so choose a diamond large enough to remain a prominent feature in a tension mount. As with diamonds, rubies and sapphires must have no internal flaws or fractures to be tension-set. Both rubies and sapphires are a form of the mineral corundum; only diamonds are a harder gemstone. Although rubies are invariably some shade of red, sapphires can be almost any color from classic blue to clear, pink, green, or yellow. The most important consideration aside from the integrity of the stone is whether it has been treated to enhance its color. Treated rubies and sapphires are not suitable for mounting in tension settings as the process may weaken the stone. Because of the way rubies and sapphires are formed, finding flawless specimens is difficult. A large ruby strong enough to tolerate tension mounting would be quite expensive. A smaller stone in a slender tension band is one possibility, as is choosing a stone that doesn’t have the depth of color of a more expensive gem. Tension settings, unlike other rings, cannot be resized. As the ring itself acts as the support for the stone, cutting a segment out for resizing would make it fall to pieces. Tension-set rings must be ordered in a special size or bought from larger retailers that have a selection of sizes in stock. Tension mountings are more expensive than traditional settings, partially because of the skill required to manufacture the rings and partially because the nature of the setting necessitates a high-quality stone. Tension settings contain two to three times as much metal as traditional rings, which also adds to the cost of these rings. Expect to pay between a thousand to two thousand dollars more for a tension setting than for a traditional pronged setting of the same diamond. The beauty of tension settings is that so much can be done with the style. Everything from a classic “omega” design of a round diamond held in place on two sides by a simple band to twists and whorls in striking contemporary shapes are possible. Consider the style of wedding band that would accompany a tension setting carefully. Slim custom-fit wedding rings that follow the flowing contours of the tension mounted engagement ring work well, as do rings with channel-set round or baguette diamonds. Baguette-shaped diamonds have a modern look that complements the clean-lined look of tension settings. Certain shapes of diamonds tend to look a bit larger than their carat weight and can also be tension set; consider pear shaped, oval, or marquise cut diamonds to maximize the look of the stone without paying a larger price for a heavier gem. 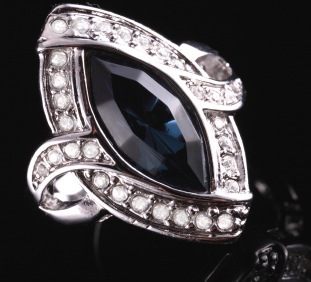 As tension mounts allow light from all sides to enter the stone, even smaller diamonds have more fire in such a setting. While a diamond much narrower than its band could look a bit lost, one that’s the width of the band or slightly larger will look as brilliant as a considerably larger diamond in a traditional pronged setting would. The low profile of tension mounts makes them practical despite their ethereal look. For a woman who works with her hands or rarely wears jewelry, tension settings offer an elegant and dramatic look without the upkeep that a pronged setting requires. Because the craftsmanship of tension settings must be so precise, not every jeweler can make them. Precision counts with any jewelry design, but in the case of tension mounts, the design is also the setting; there aren’t any corners to be cut with tension settings. Finding an expert is important. The premier manufacturers of tension settings are Danhov, Gelin Abachi, and Kretchmer.